NodeWeaver and Packet have teamed up to deliver reliable, simple, flexible, and cost-efficient infrastructure solutions on demand from Packet’s public cloud and edge locations. Get all of the features, functionality, reliability, and ease of use of public cloud services with the privacy and control of dedicated infrastructure. NodeWeaver is a 100% software-only hyperconverged infrastructure solution, which enables the creation of highly available, secure, and autonomically managed cloud clusters on virtually any x86-based hardware. 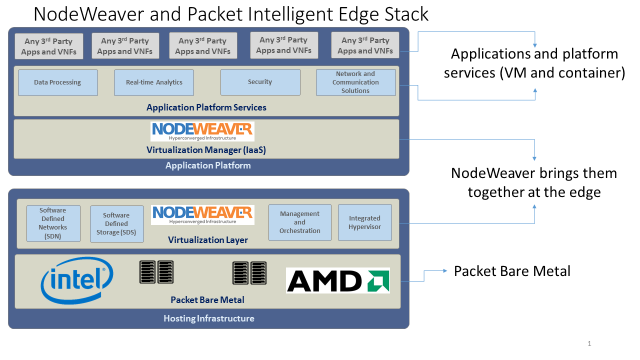 Using NodeWeaver combined with Packet’s innovative Bare Metal as a Service, customers can rapidly and efficiently deploy dedicated private cloud infrastructure for running a wide variety of workloads and easily deploy VMs, containers, storage, and network resources to rapidly launch and scale services from any Packet location. Customizable NodeWeaver Marketplace enables the creation of pre-defined and custom application stacks and templates that automate the application deployment process. NodeWeaver clusters operate independently of one another but are managed from a single pane of glass. NodeWeaver was built for customers with little to no technical expertise. NodeWeaver implements itself on target hardware with the responses to five questions. NodeWeaver manages application load balancing on nodes in a cluster. NodeWeaver detects defective hardware and works around cluster issues. NodeWeaver enables customers to replace hardware components on live systems and then rebuild the node with data, without user intervention. New nodes can be easily added and automatically load balanced within the cluster.